The 2015 Stanley Cup playoffs are here, and it's time for this year's edition of pinup girls, picks to win and of course,the Atom-Bomb Bikini Playoff Challenge! Read through to the bottom of this post to see how you can win some art, books, stickers and other great stuff! Boy, it's really great that the Sens managed to get into the playoffs, ain't it? Of that final cluster of three teams vying for the two wild card spots, Ottawa was by far the most deserving. They've basically been playing playoff hockey since St. Patrick's Day, and while there's always a chance they'll knock off the mighty Canadiens, I think the clock has finally struck midnight on their Cinderella story. Habs in six. It's the Red Wings against the Blue Wings. Two teams, great on D, with exciting forwards and the ability to score a lot of dazzling, pretty goals. Bolts in six. The Rangers are feeling their oats. A bunch of moves and events that I figured would blow up in their faces (Rick Nash, Lundqvist's injuries) have instead propelled them to the top of the league and won them the President's Trophy. Last year's run to the finals seems to have emboldened them, and they know they can win. The Penguins, on the other hand, are a dumpster fire, and needed a narrow victory over the worst team in the NHL on the season's last day to back into the playoffs. While it's true they've been beset with injuries all season, nothing they've done to solve their problems has worked, and the entire organization has at times seemed like it's being run by the three stooges. You hear a lot of "Anytime you have Crosby and Malkin on your team…" from out-of-towners, but anyone who's watched the team all year knows they have virtually no shot. They're fragile as kittens, the power play is a liability, and the only thing the top scorers have been producing since St. Patrick's Day are excuses. I can't imagine they'll even win a game, but I'll be conservative and say Rangers in five. The Caps and Isles have been jockeying for position all season, and when New York faltered a a bit down the stretch, Washington slid into that second spot, earning home ice for the first round. They're pretty evenly matched, and as much as I feel like the last playoff run in Nassau Coliseum will give a lift to the Isles, the Caps seem to be hitting their stride. Caps in seven. The Blues went on a tear at the end of the season to pull ahead of Nashville for the top spot in the Central, earning them a matchup with the wild-card Minnesota. They're still the Blues, though, which is what they'll be crying when Devan Dubnyk and the Wild shut them down. Wild in seven. Nashville led the Western Conference most of the way this season, before cooling off towards the end, going winless in their last six games to surrender the top spot to the Blues. Chicago, meanwhile, has kept on keeping on, and will welcome superstar patrick Kane back into the fold soon, most likely sometime in this series. Still, I think the Predators will get it done. That "Smashville" nonsense is gonna get really old. Preds in six. The city of Winnipeg finally gets back to the playoffs, and they figure to give Anaheim all they can handle in a long series. Jets in seven. I'll be honest with you...I haven't watched a single damn minute of the Canucks OR Flames this season...but I'm super happy to see Calgary back in the postseason, and I think this will be a really even, entertaining series to watch. Flames in seven. 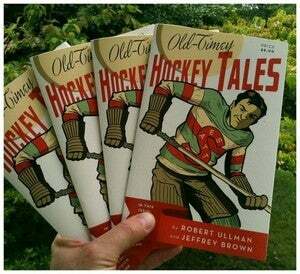 Here's what you're playing for: The big winner will receive a custom piece of original artwork of a pinup girl wearing the jersey of his or her favorite team, along with both issues of Old-Timey Hockey Tales, a pack of Atom-Bomb stickers and a free t-shirt of your choice from the wonderful folks at Original Retro Brand! Two runners-up will just get the books and stickers...and in case of a tie, I'll put all the names in a hockey helmet and select a winner at random. How to enter: Write your picks in the comments section of this here blog post. Not on Facebook, not on Twitter, not in an email, but in the comments section of this post. And an onslaught of much needed work has made it impossible for me to finish the art on time, so everybody gets one free game! That's right, you have until the pucks drop on Friday night to enter! And finally, please, if you have a Twitter handle or something like that that you wouldn't mind adding to your post, that'd be great....I don't want to have a prize go unclaimed because I had no way of getting in contact with the winner! Enjoy the playoffs, folks (I figure my interest lasts five games at most *grumble*)... and good luck! CRASS COMMERCIALISM DEPT: All of the original, hand-drawn art for this year's Stanley Cup picks will be on sale soon...but much of the art from previous years is currently available at my Etsy store!